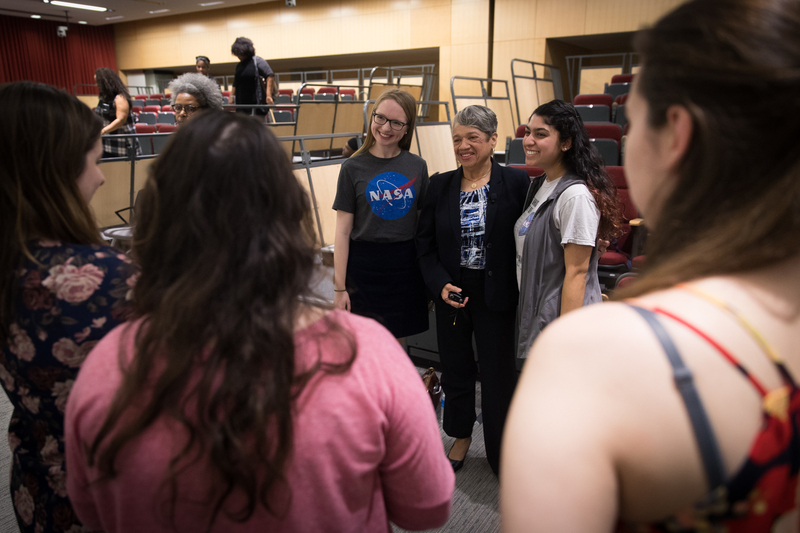 The GW alumna talked about her work at the space agency and her career in mathematics and engineering after a screening of the award-winning film. NASA engineer Christine Darden is often asked which movie star played her in the motion picture “Hidden Figures,” the film about African American women who worked as human computers during the era of the space race. Dr. Darden earned her doctorate in mechanical engineering from GW in 1983. Her work was in aerodynamics and not space flight, and she was still in high school during the period focused on in the film. The screening at GW was her 13th time seeing the movie. The Dean’s Council of Women in Technology sponsored the Tuesday evening screening and conversation in observance of Black History Month and Engineers Week. Dr. Darden became one of NASA’s human computers in 1967 and had an illustrious 40-year career at the Langley Research Center, becoming a leader of the group working on sonic boom minimization. David S. Dolling, dean of the School of Engineering and Applied Science, introduced Dr. Darden, who was inducted into GW’s Engineering Hall of Fame last year. He said one way to put her career in perspective is that NASA awarded her a certificate for outstanding performance 10 times and showcased her as one of seven inventors who contributed significantly to the space program. In comparing her time at NASA to those of the other women in “Hidden Figures,” Dr. Darden said she did not experience the racial discrimination they were subjected to no doubt because she joined NASA years later. Even as a woman, she said the worst she encountered was being second-guessed as she recounted an instance when her calculations were repeatedly questioned and dismissed by an engineer. Students pose with Dr. Darden after screening of the film "Hidden Figures" at SEH. By the time she arrived at NASA, women working in the computer pools were integrated. But like the women in the movie, she initially found it frustrating that she was doing calculations without being told what they were for. So she got out of the computer pool and into engineering. There, she worked in an environment surrounded by all white men and very few women. She later learned that Mary Jackson, who was featured in the “Hidden Figures” movie, advocated for a promotion for her at NASA, knowing that Dr. Darden was already doing work comparable to others who were advancing. The question of whether she faced obstacles as a woman and as an African American woman was brought up by GW students in the discussion following the film’s screening. The Q & A session was moderated by Samsara Counts, chair of the SEAS Dean’s Council of Women in Technology. She had been a high school math teacher who switched to engineering after earning a graduate degree in applied mathematics. Dr. Darden spent 25 years of her career working on minimizing and softening the shock from sonic booms that has blocked supersonic air travel. She envisions that progress in solving the problem will lead to reducing flight time from the East Coast to West Coast to about 2.5 hours. She encouraged parents to expose their children early to math programs. “Don’t let people tell your girls that girls aren’t engineers, which I still hear people say,” Dr. Darden said. Eight women will be able to conduct research under faculty mentors as part of funding from the Clare Boothe Luce Program. Variety of programs available to female secondary school students are intended to keep women at the forefront of a growing field.